Current technologies and solutions suffer from limitations that keep them from seriously challenging centralized incumbents. The most severe limitations are around performance and scalability. The next few years will be about fixing these limitations and building networks that form the infrastructure layer of the crypto-stack. After that, most of the energy will turn to building applications on top of that infrastructure. The terms cyptocurrencies and blockchain are often fused and amalgamated in people’s minds, thanks to all the hype and overexposure. However, there exist three key (inter-related) phenomena in the crypto ecosystem, each with rapidly evolving trends—digital currencies, initial coin offerings (ICOs) and blockchain technology. Currently, there are close to 1,500 cryptocurrencies, tokens and “alt coins” listed across various exchanges, according to CoinMarketCap.com. This number has almost tripled in the last two years. The open-source nature of most cryptocurrency systems means that it is fairly easy to make copies of the software (or “fork” its code, in developer parlance), make some modifications to the protocol, and release it as a new, wholly separate system. This was witnessed in recent years. As bitcoin’s price began to increase rapidly in the second half of 2013, many developers began forking various cryptocurrency protocols to establish their own coins. The goal was to create cryptocurrencies as valuable, at least in the short term, as bitcoin. This somewhat haphazard approach of throwing cryptocurrencies against the proverbial wall and hoping that something would stick was certainly effective at expanding the scope of blockchain-based currency systems. In 2017, a large number of retail investors, especially from China and Japan, with little knowledge of cryptocurrencies, started buying and trading all forms of digital currencies, along with some institutional investors who looked at “cryptos” as a potential hedge for their positions in equity and bond markets. This led to significant rise in the value of digital currencies all through the year. However, the recent announcements by global technology companies such as Google, Facebook and Twitter on ban on ads of digital currencies, along with various governments banning the sale and, in some cases, trade and acceptance of cryptocurrencies as legal tender have dented the rise of these assets. Currently, we are witnessing the early stages of stable coins (such as Tether, Havven, MakerDao and Basecoin). A “stable coin” is a cryptocurrency that is pegged to another stable asset, like gold or the US dollar. It is a currency that is global, but is not tied to a central bank, and has low volatility. This allows for practical usage of cryptocurrencies like paying for things every day. An initial coin offering (ICO) is a fundraising tool that trades future cryptocoins in exchange for cryptocurrencies of immediate, liquid value. In 2016, there were 50 ICOs, which increased to 250 in 2017. The first three months of 2018 have already witnessed the launch/announcement of over 500 ICOs. ICO is fast evolving as a successful fundraising approach for start-ups. In 2017, funds raised by ICOs far exceeded the venture capital funding for cryptocurrency and blockchain-based start-ups. According to Crunchbase data, in 2017, $1.2 billion was invested by venture capitalists in blockchain-based companies, while over $4 billion were raised through ICOs. ICOs are also changing the investor profile for start-ups. While in the venture capital model, it is the partners and fund managers who take a “yes/no” decision on a start-up’s future, based on a set criterion, in an ICO the investor is typically a 20- to 30-year-old computer specialist who has been an early adopter of cryptocurrency mining—and relatively more open to new and risky ideas. In the technology start-up ecosystem, “on the blockchain” is the new “Uber”. 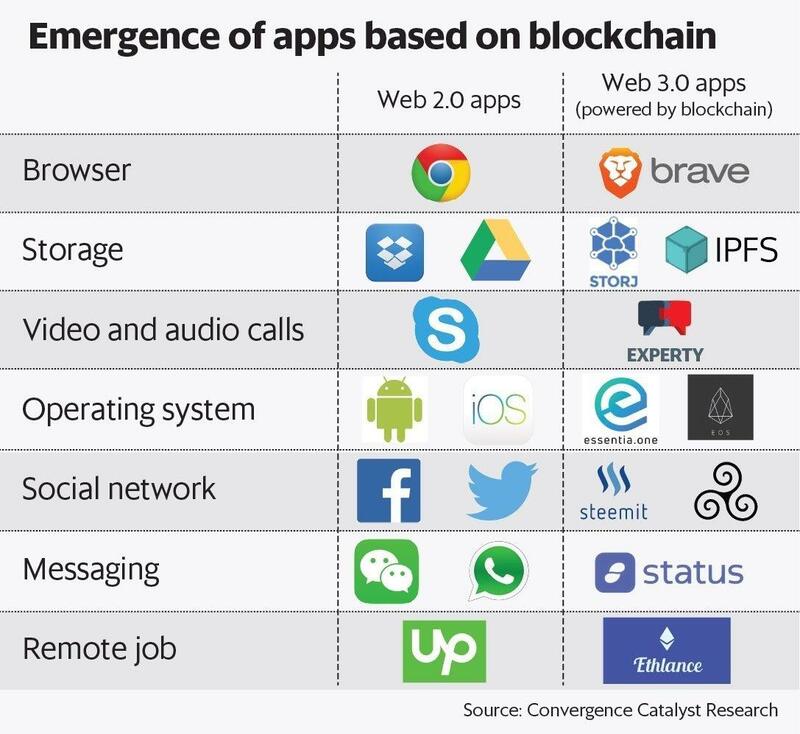 There exist over 1,000 DApps (decentralized apps—apps built using blockchain technologies) across 36 industries. All kinds of Web and mobile-based solutions are now being developed on blockchain. The blockchain technology that powered bitcoin is a relatively bare-bones system that requires layers of protocols to be built on top of it to make it a usable platform for utilities like smart contracts. Ethereum, on the other hand, was launched with its own scripting language baked in, making it possible to build complex smart contracts, decentralized autonomous organizations, DApps and even other cryptocurrencies with relative ease. Bitcoin’s rise to popularity resulted in its supporting blockchain technology, being categorized as Blockchain 1.0. Ethereum’s broad adoption as a decentralized platform for applications to run exactly as programmed enabled it to be categorized as Blockchain 2.0. Currently, we are witnessing a new set of blockchain platforms and networks based on DAG (direct acyclic graph) technology. There exist a number of DAG-based blockchains such as Hashgraph, IOTA, Stellar, NEO, RaiBlocks, etc., which have been developed for specific real-world problems. These platforms belong to the third generation, or what we call Blockchain 3.0 group, and are developed to overcome the key issues of the original blockchain (Blockchain 1.0) and Ethereum (Blockchain 2.0), and are designed on the FFM concept (fast, feeless, minerless). DAG-based blockchain technologies remove the “miner” from the equation by using “Gossip about Gossip” protocols, in which the machines on the network spread the transaction information and verify and authenticate, instead of the Gossip protocol used by (first-gen) blockchain and Ethereum—in which there is a dependency on the miner to solve the puzzle, and verify and authenticate the transaction. While theoretically, these technologies are capable of handling hundreds of thousands of transactions (per second) as compared to six-seven transactions per second by Blockchain 1.0, we have witnessed certain DAG-based platforms perform over 10,000 transactions per second in real-world scenarios. Hashgraph is one of the most popular and leading DAG-based blockchain technologies. The firm that developed it—Swirlds—is adopting the right strategy of designing and positioning it as a “white-labelled, private chain”, targeting large enterprises across industries to solve real-world problems—instead of developing another crypto-token for public sale. These third-generation, DAG-based blockchains are definitely a step in the right direction, but the question—will it be the definitive platform of the future and end of it all—is far from being answered. At the moment, in terms of the blockchain ecosystem’s evolution, we are in the mid-1990s of the internet era. It is difficult to differentiate the Amazons and Googles of the blockchain world from the Pets.com and eToys. The current technologies and solutions in the space suffer from limitations that keep them from seriously challenging centralized incumbents. The most severe limitations are around performance and scalability. The next few years will be about fixing these limitations and building networks that form the infrastructure layer of the crypto-stack. After that, most of the energy will turn to building applications on top of that infrastructure. ← Is Facebook in trouble?